A winter hike in beautiful British Columbia. 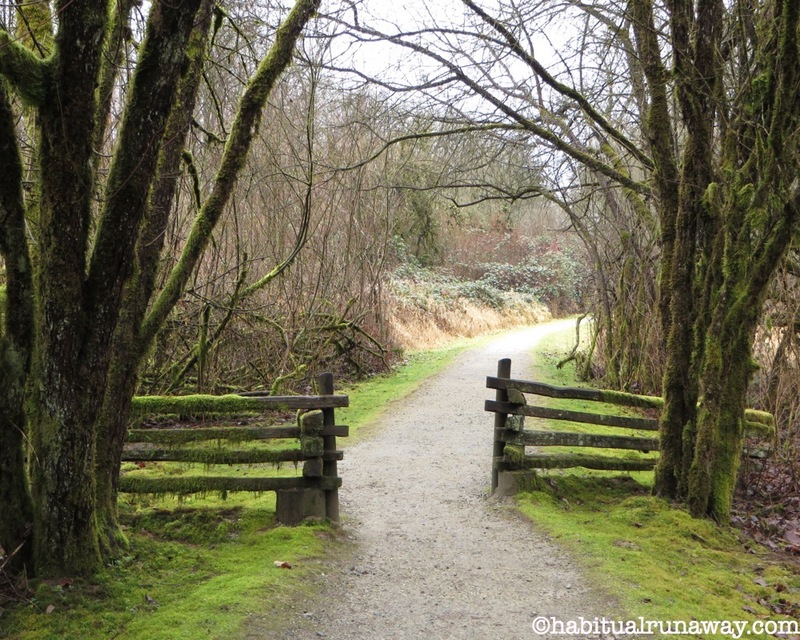 Join me on Instagram for daily uploads and many, many more photos of travel and my beautiful home, British Columbia. Often times I remind myself why I live in BC. It is not really in my nature to ‘settle down’, but I have done just that. I am not from BC, but spent my childhood in small towns neighbouring the city I landed in as a teen (and stayed in through to my 30’s) – Toronto, Ontario. I loved Toronto, and still do. It is a remarkable, world class city. I admit, I spend a lot of time homesick – but after many years enjoying my incurable wanderlust, I have discovered that there is no better place, perhaps in the world (and certainly in Canada), than beautiful British Columbia. Mount Baker, a most impressive volcano. We have mountains (and ocean). 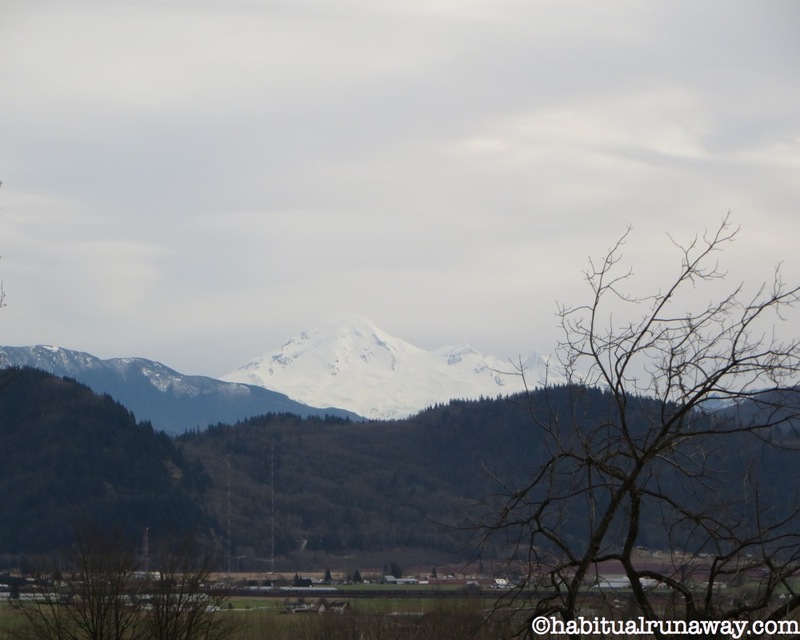 And not just any old mountains – we have a number of major ranges AND a spectacular view of the impressive Mount Baker – which is not a mountain at all, but a volcano. 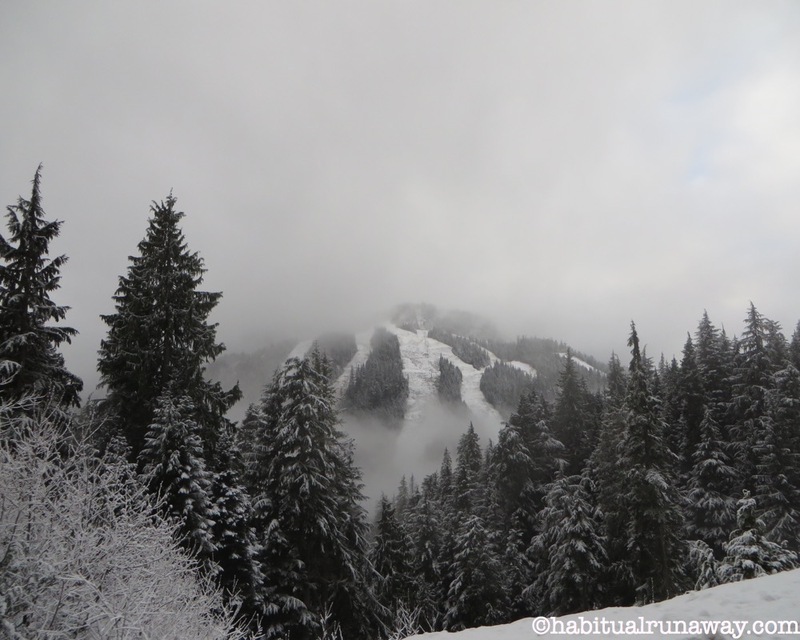 A bit of snow at Cypress Mountain. When it is warm (temperate coastal climes) at home, you can head up a mountain for some skiing (or boarding). It used to be said that if you were ambitious, you could golf, sail and ski in one day – but the weather has been changing and this years ski season was very brief. It was just too warm, and we were lucky to get out to Cypress for a ski when we did. The mountain has already returned to green. 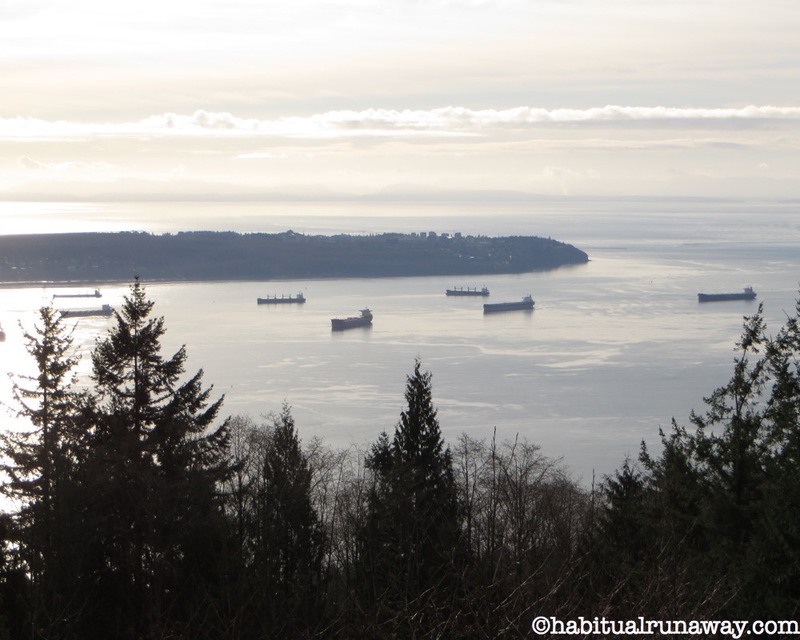 View of the Pacific ocean and Burrard inlet from Cypress mountain lookout. …But even without the snow for skiing, you can always take a tour up to check out the amazing views of the ocean and Burrard inlet (above, as seen from the Cypress mountain lookout). From the lookout, you can get an idea of how incredible the Vancouver area is. 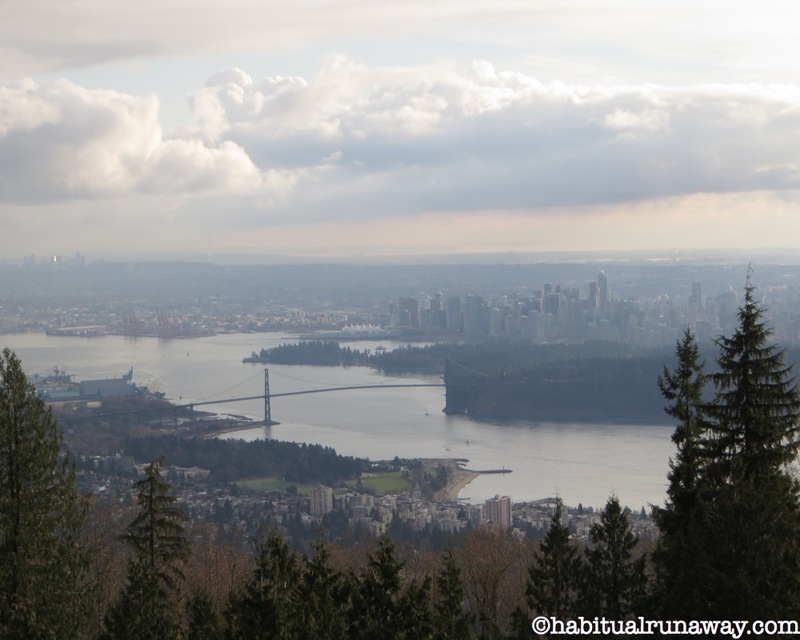 Pictured below, to the right in the distance, that mound of undeveloped forest is Stanley Park – one of the worlds most impressive public city parks. View of Vancouver and Stanley Park from Cypress Lookout. 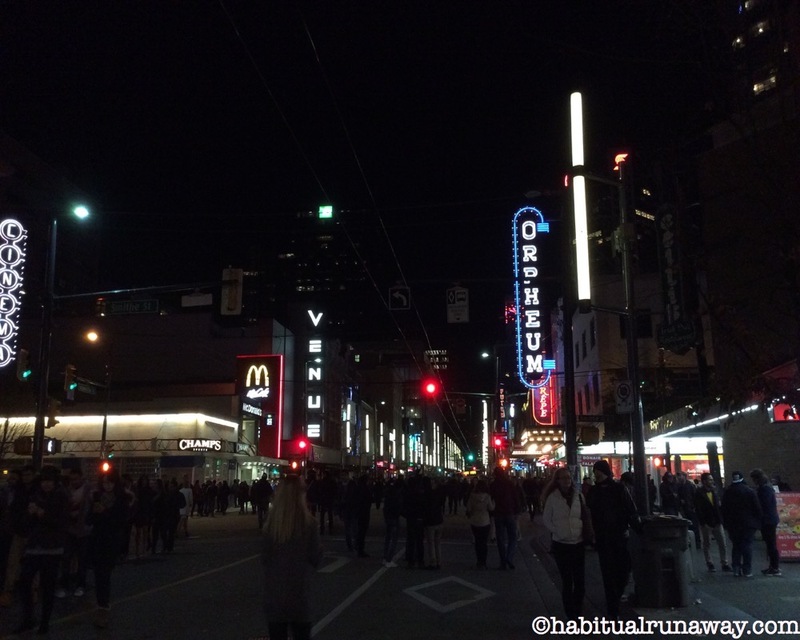 You can always rely on Granville street (arguably Vancouvers main, most popular artery) to draw up a crowd during occasions – even if the city itself has an issue ‘putting out’. Vancouver has a reputation as a ‘no fun city’, mainly because of its lack of public events – it is one of the only major cities in Canada that doesn’t have a free, inclusive New Years Eve event. Granville St. on New Years Eve. …But people flock to Granville regardless. The city blocks traffic and people parade up and down the street, greeting each other, enjoying the revelry – turning Granville into one very large block party. Yes. it rains. But it isn’t what people think. I always hear ‘how can you handle the rain, Ana?’ Well, number one – it does not rain every day – as a matter of fact it really only rains during the winter – and NOT every day (much to the chagrin of my garden that needs to be frequently watered during all other seasons, and my grass that inevitably browns almost every July and August). 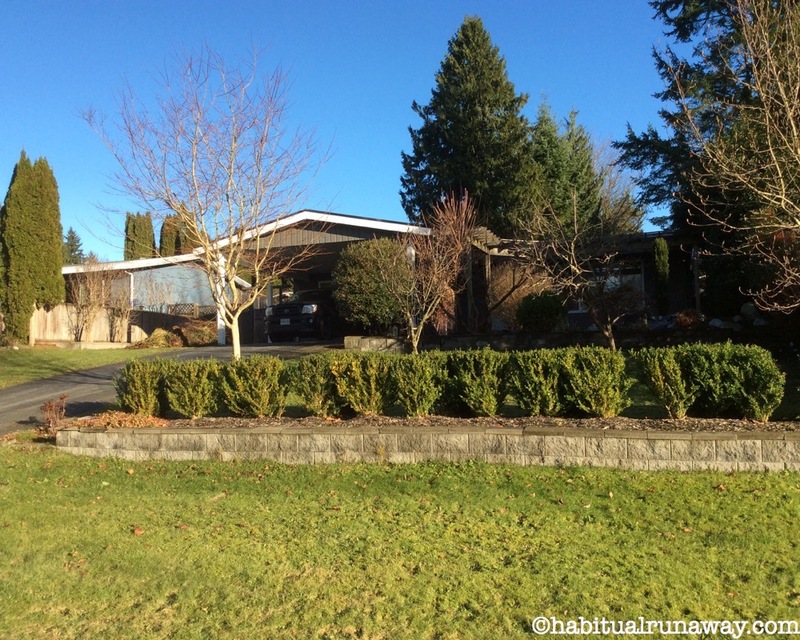 A January view of my home. I have definitely chosen rain over snow. It is warmer and you don’t have to shovel! 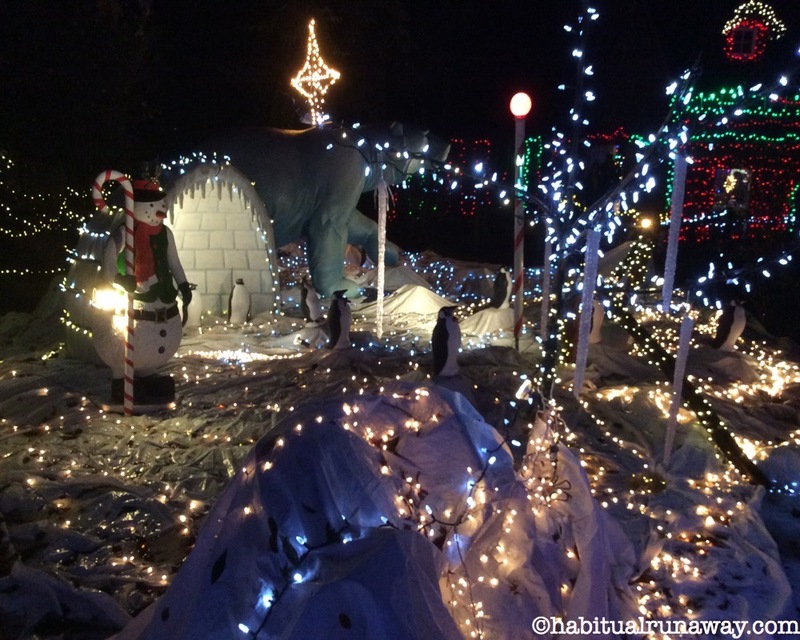 When you want ‘snow’, you need only lay out a few white tarps – as they did in Stanley Park over the Christmas season. Winter ‘snow’ in Stanley Park. Speaking of gardens, I do have an all season garden. In the winter I can grow herbs, radishes and lettuces outdoors, and am regularly shocked by what else pops up unseasonably – like my tulips that decided to bloom in December. 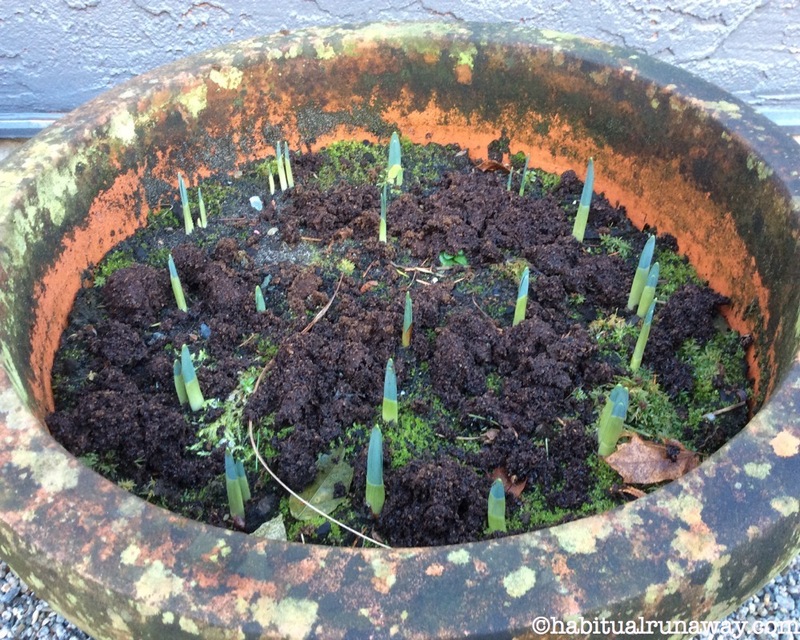 I discovered them while gardening in a sun dress and rubber boots on December 12th. Now, I know that others experience the luxury of warm winters – particularly those closest to the equator (the southern States, those in the tropics, a large portion of southern Asia and so on), it just isn’t something most expect from Canada. Truth be told, the majority of Canada DOES head into a deep freeze for the better part of four months. Some provinces enjoy sub zero temperatures for even longer (much longer). But not the lower mainland (and southern most islands) of British Columbia! 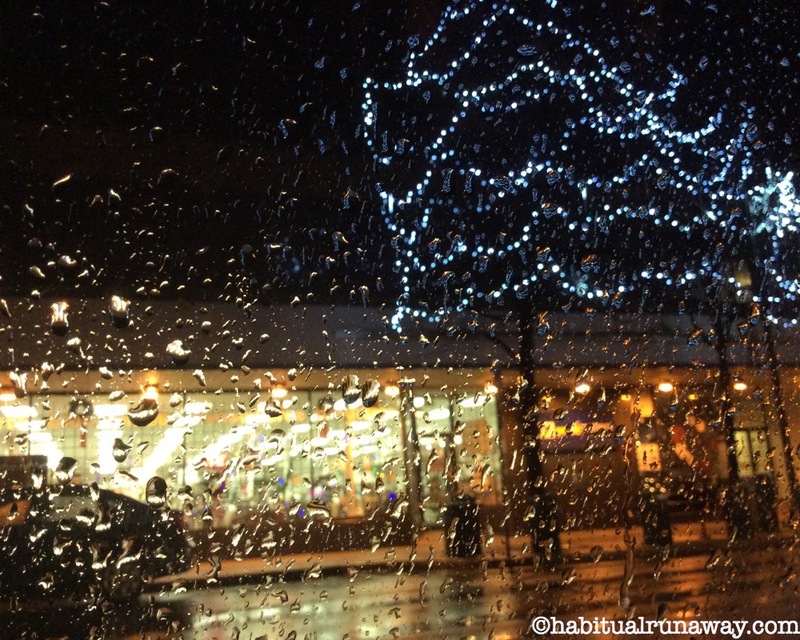 Typical winter on the lower mainland. 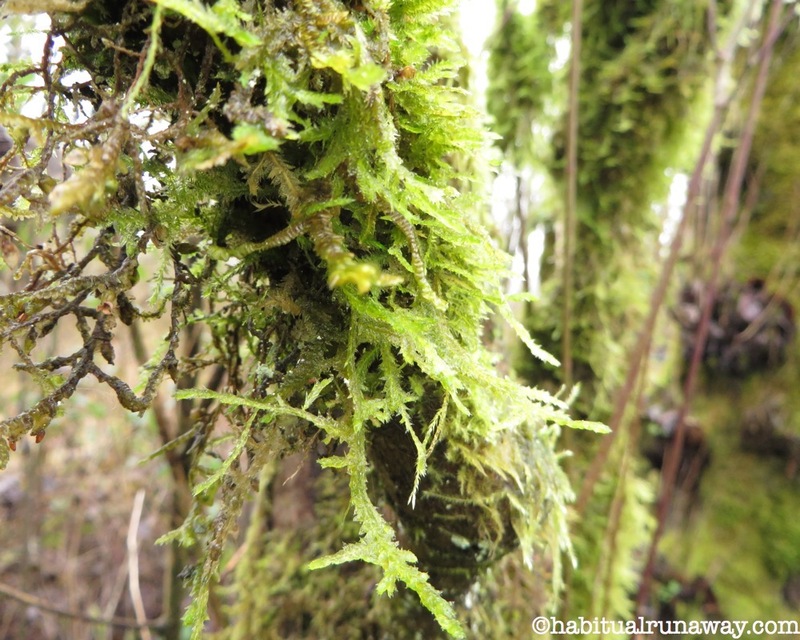 Currently my favourite winter hobby is hiking through the mossy forests. The temperature is perfect, no blistering sun, no heat exhaustion and plenty of lush green views. Aside from the deciduous trees that have dropped their leaves, there is still plenty of growth through the whole season. 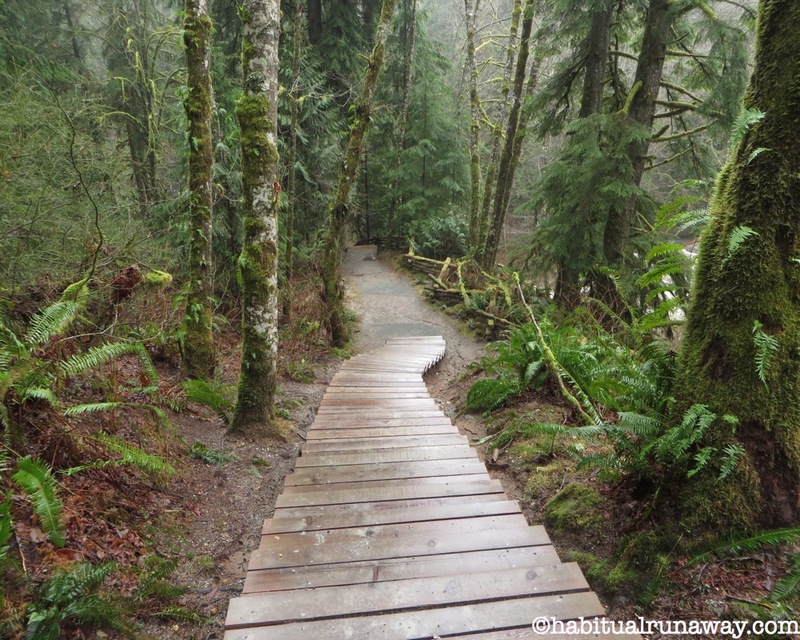 It smells fantastic, and you don’t have to fight through crowds to enjoy your walk. I have felt guilty about my ‘winter’ hikes – enjoying them coatless while the rest of my family in Ontario freezes and shovels their way through the season, avoiding the outdoors at all cost. But it isn’t just nature. It is also the food. Second best Thai food on the planet. I lived in Southern Asia for a year, and it cannot be argued that the second best Asian food on the planet exists here. We are close to ‘the east’, and home to many Asian migrants – so the food is deliciously authentic. 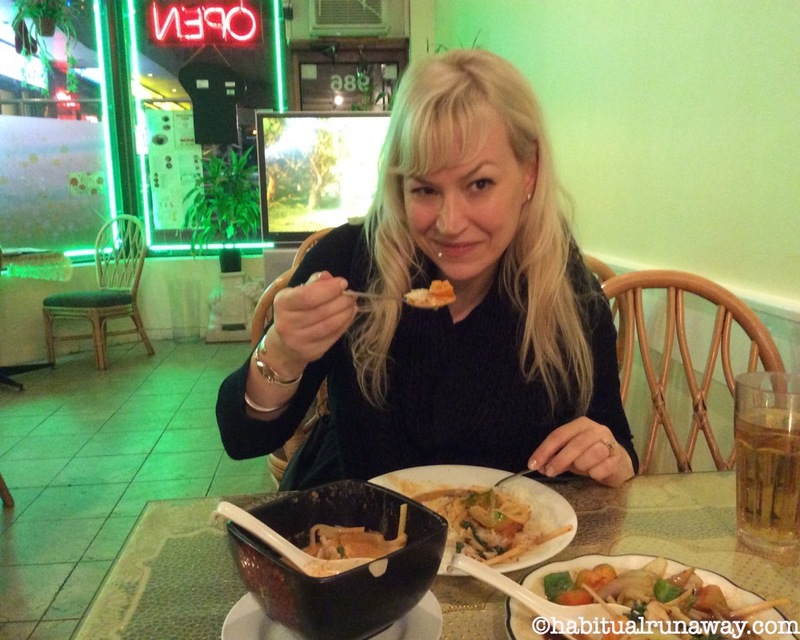 I am (very) partial to Thai food, and have found it to be JUST as good here as it was in Thailand. That’s saying nothing of the Indian food available (delicious!). And if you like seafood (sadly, I am allergic), I am told it doesn’t get fresher or better than here on the Pacific west coast. So there you go, a few reasons why I chose to settle here, of all the places in the world – and a few reasons why you should make a visit too. Why not come in the winter? 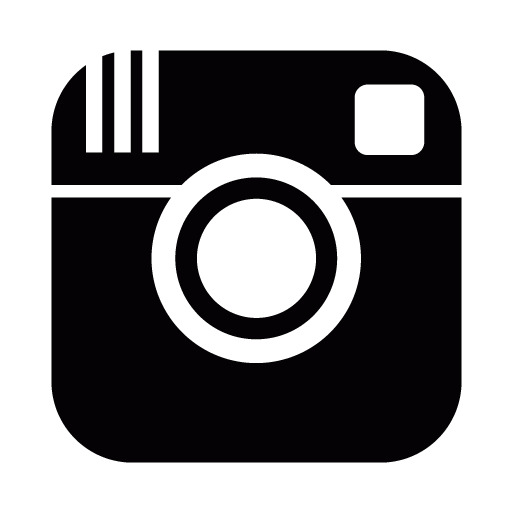 As I mentioned, you can follow me on Instagram now, where I am regularly uploading photos from current and past tours, home and abroad. There is a permanent link above and to the left that you can check out any time. 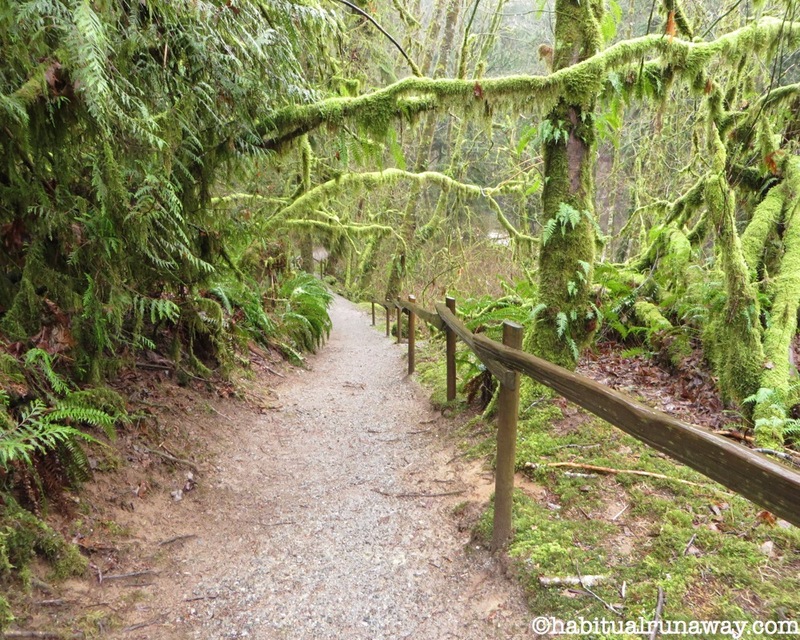 Everyone I know who has been to BC has loved it and your gorgeous photos show why. I’m surprised to read about your warmer than average winters. I’ve always imagined all of Canada to be frozen over in winter. It sounds lovely. The older I get the less I like cold weather. That’s exactly why I mentioned the warmer winters (the real reason I am here!). Many people don’t know – as a matter of fact, I still have friends in Toronto who don’t believe me!! I too am not fond of a harsh winter.